Spectra Galaxy JA 256/50pl AAA print head is a high performance, robust and reliable jetting assembly designed for a broad range of wide format printers at resolutions up to 600 dpi. 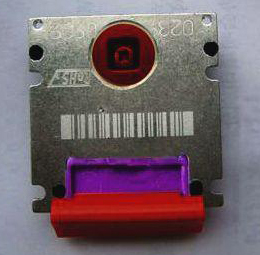 Four electrically independent piezoelectric slices, each with 64 addressable channels, are combined to provide a total of 256 nozzles in Spectra Galaxy JA 256/50pl AAA print head. The nozzles are arranged in a single line, at a native 0.010 inch distance between nozzles. 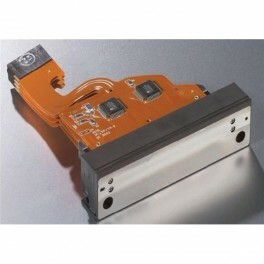 The fluid interface and electrical connection in Spectra Galaxy JA 256/50pl AAA print head are at the top of the jetting assembly and several mounting configurations are possible. This jetting assembly contains serial-to-parallel converters for selecting which jets to fire; all jets can be fired simultaneously or individually.